Netanyahu: The Bibi Who Cried Wolf? Israeli Prime Minister Benjamin “Bibi” Netanyahu’s constant, dire warnings about Iran convey one quality in great abundance: Sheer confidence. With an air of omniscience, he tells us precisely what the Iranians are thinking, planning and doing—even what they will do in the future. This is, however, the same man who—with every bit as much outward certainty––declared that Saddam Hussein was “feverishly” developing nuclear weapons as he urged the United States on to an invasion that proved wholly unjustified. While Netanyahu’s assertions about Iran’s nuclear program are grave, it could be the gravest of errors to assume that what he’s saying is true. 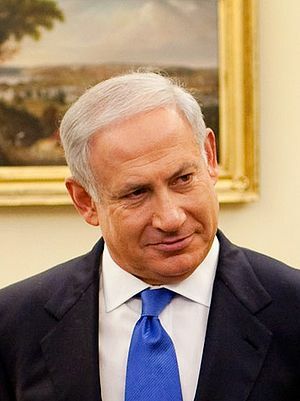 On September 12, 2002, Netanyahu testified at a U.S. House of Representatives hearing titled, “Conflict with Iraq: An Israeli Perspective.” At the time, “conflict with Iraq” wasn’t underway; rather, it was being contemplated—and aggressively pushed by the Bush administration, Netanyahu and others. We now know his emphatic claims were emphatically wrong. That knowledge came at a terrible price—in American and Iraqi lives and limbs, and in more than $800 billion of U.S. taxpayer money…and counting. If Netanyahu was so categorically wrong about Iraq, is it wise to put faith in his claims about Iran? It wouldn’t be equitable to evoke the fable of The Boy Who Cried Wolf without acknowledging that, while the Aesop character’s first cries of “wolf” were false, his final one was not. Ignoring his pleas, the villagers’ inaction allowed a very real wolf to slaughter the boy’s flock of sheep. With that in mind, and given what’s at stake, we have a duty to carefully examine warnings about Iran now presented by Netanyahu and others. Iran has decided to build a nuclear weapon. If Iran acquires nuclear weapons, it will use them regardless of the consequences to itself. Let’s examine each one separately. As we do, bear this in mind: The question isn’t whether Iran’s public rhetoric is offensive or its human rights record highly defective—those factors alone wouldn’t be sufficient to wage war. If they were, we’d be bombing or invading much of the world. Has Iran decided to build a nuclear weapon? While those who study Iran closest agree it isn’t developing a nuclear weapon today, some are concerned that its peaceful nuclear program could turn military, noting that the further its peaceful program advances, the faster Iran could pivot into military use. Iran has already seen the United States execute “regime change” invasions and decade-long occupations of both its eastern and western neighbors. The United States and Great Britain overthrew Iran’s own democratically elected leader in 1953 to replace him with a West-friendly tyrant. Are Iran’s leaders bent on genocide? Iranian President Mahmoud Ahmadinejad is widely quoted as declaring “Israel must be wiped off the face of the map.” Time and time again, these words are offered as proof of genocidal intent, repeated not only by Netanyahu but by politicians, reporters, commentators and everyday citizens—the trouble is, he never said them. What he did say, as he in turn quoted the Ayatollah Khomeni, was, “The Imam (Khomeni) said this regime occupying Jerusalem must vanish from the page of time.” As Arash Norouzi explains in a detailed analysis of the sentence and its context, Ahmadinejad was comparing the Israeli “regime” with other once-powerful regimes that had fallen, including the Soviet Union. In other words, he wasn’t calling for the annihilation of a population, but for the dismantling of a governing entity. That’s highly antagonistic language, to be sure, but it’s not genocidal—any more than Ronald Reagan’s assertion that “freedom and democracy will leave Marxism and Leninism on the ash heap of history” was a pledge to incinerate the Soviet, Chinese or Cuban people. Ahmadinejad’s inflammatory statements are also awash with contempt for “Zionists,” yet, significantly, not “Jews.” There is a distinction: “Zionism” refers to the nationalist movement which championed the creation of the Jewish nation-state of Israel. Underscoring that distinction, there are Jewish anti-Zionists who embrace Judaism but actively oppose the concept of the modern country of Israel. Iranian leaders’ opposition to the formation and perpetuation of a government or country may be objectionable, but is it genocidal? Those who accuse Iran of genocidal intent must reconcile the fact that Iran has the second-largest Jewish population in the Middle East—behind only Israel itself—living peacefully and openly, praying in synagogues and even operating Hebrew schools and hospitals …and the fact that the Ayatollah Khomeni, after the 1979 revolution, issued a fatwa prohibiting the harassment of Jews and other religious minorities. If Iran acquires nuclear weapons, would it use them regardless of the consequences to itself? This question might be rephrased another way: Are Iran’s leaders rational and concerned with self-preservation, or are they impulsive and suicidal? After all, a nuclear strike executed by Iran or by terrorists it equipped would invite Iran’s own devastation. “I think the Iranian leadership is composed of very rational people.” Israeli Defense Forces Chief Benny Gantz. “We are of the opinion that the Iranian regime is a rational actor. They act and behave as a rational nation-state.” U.S. Chairman of the Joint Chiefs General Martin Dempsey. “The regime is a very rational regime. There is no doubt they are considering all the implications of their actions.” Former Israeli Mossad Chief Meir Dagan. “Iran poses a serious threat but not an existential one.” Former Israel Defense Forces Chief of Staff Dan Halutz. “We continue to judge that Iran’s nuclear decision-making is guided by a cost-benefit approach.” U.S. Director of National Intelligence James Clapper. “Iran is unlikely to initiate or provoke a conflict.” U.S. Defense Intelligence Agency Director Ron Burgess. Finally, while proponents of military action against Iran may find fault with many Iranian government actions and policies, can they point to a single one that demonstrates an impulsive, reckless, suicidal or self-destructive tendency? The case for preemptive war against Iran withers under close scrutiny, revealing that the common caricature of Iran—as a maniacal, fanatical nation bent on nuclear genocide—cannot be substantiated. If the United States is to act justly and in a way that advances our nation’s true best interest and avoids shedding blood in vain, our policies must be rooted not in misinformed passion, but an objective evaluation of the facts. Regrettably, when it comes to Iran, its nuclear program and its implications for global security, the American public operates in a thick fog of myth and misunderstanding—so much so, that when the truth is shared, it sounds to many like a falsehood…or perversely, a sign of disloyalty. A truly loyal American, however, relentlessly seeks what’s best for the United States. Doing so requires an unwavering dedication to learning the truth, and a never-ending vigilance against misinformation that flows both from honest mistakes and from purposeful manipulation by those advancing their own, separate interests. Brian McGlinchey is principal at Liberty Messaging—a communications firm serving libertarian causes. He is the founder of 28Pages.org and a contributor at The Libertarian Institute.